Sometimes I think FInding Nemo is the only source of parenting advice I’ll ever need. Many days, I feel like Marlin. I don’t want to let my precious child swim out on that field trip near the edge of the reef. I want to call out to him, remind him to be careful, not get in past his depth. But that’s just the sort of thing that pushed Nemo to take risks recklesssly, to swim out to the big boat, and led him into the way of the diver’s net. And as much as I want to protect him, I also don’t want him to grow up in fear. I want him to explore this big blue world, to know that he is capable of great things. I want him to choose what risks to take not out of rebellion, but out of courage and joy. I cannot protect him from every danger in this world, and it wouldn’t be in his best interests for me to try. This is the Ocean, silly, we’re not the only two in here. We’re gonna have a great jump today. Okay, first crank a hard cutback as you hit the wall. There’s a screaming bottom curve, so watch out. Remember: rip it, roll it, and punch it. How many days must I really spend on that screaming bottom curve? Sometimes I’m tired of ripping and rolling. I want to learn from Gill. He’s sure not perfect, but he does help Nemo learn a little bit about self-reliance. I’ve got a bit of a broken fin myself, not quite like my kid’s but certainly I know what it is to walk around in this world with what some might consider imperfections. Maybe I can show my kid that my lucky fin never stopped me. And really, Marlin’s got a bit of a broken fin himself, though it doesn’t show on the outside. He’s still struggling with love and grief, having lost most of his family in what my spouse refers to in an 9/11 allegory at the beginning of the film. His heart is broken, and he truly believes the only way to stay safe is to live in fear, to never let go. And of course, when all is said and done, Marlin eventually learns to let go, to trust that Nemo knows how to save the fish caught in the net in the film’s climactic scene, and we see that Dory’s right, that we’re not the only two fish in the ocean, that we can do together what none of us can do alone. I hope I can keep learning that lesson too. From withonea, who’s also got a pretty sweet Finding Nemo vs. Teenage Mutant Ninja Turtles trailer. From ihasahotdog.com, a close sibling of icanhascheezburger. Shhh . . . don’t tellz sambycat . . .
From icanhascheezburger, bien sur. Finding Nemo fans might like this one too. It is a somewhat embarrassing fact of my Disney obsession: I feel the need to attend Disney on Ice virtually every time it comes to town. When Broke Hoedown Jr was younger, I could kinda pass it off on him. Everybody understands a mom taking her 5-year-old to the cute little ice show, right? But now that he’s eleven, and tall for his age, it’s impossible to hide the fact that I’m the one who really wants to go. On the way in, I asked him whether we should perhaps bring his younger cousins along next time. He saw right through my ploy, and told me that if he wasn’t embarrassed to be there without a little kid, why should I be? He even asked me why I hadn’t brought my Pal Mickey (truth is, I would’ve brought him if I’d thought of it). Now, I wouldn’t keep going to these things if there wasn’t something good about them, and today’s show was no exception. 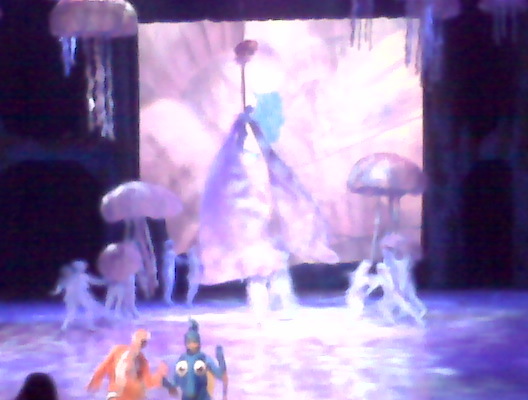 Today, we saw Disney on Ice: Finding Nemo (or, as Mr Broke Hoedown prefers to call it, Finding Nemo On Ice). It had the excellence in costumes, choreography, and scenery to which we have become accustomed. (I wish I could have gotten a few good pictures; I’d obeyed the warning on my ticket that said “no cameras allowed,” and then watched with some frustration as everybody around me snapped away merrily with their good cameras, and all I had was my Blackberry.) While some scenes just couldn’t come across right on the ice (such as Marlin and Dory inside the whale), others were whimsical, almost delightful. 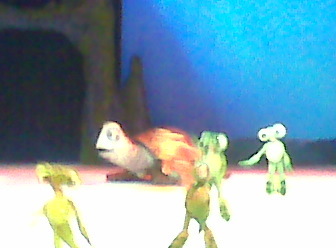 The jellies came across just right, and the stage full of twirling little turtles was almost too cute to bear. And you know that I cheered and waved when Mickey and friends skated onto the stage, right? Being a Disney on Ice veteran viewer, I knew what I was getting myself in for in terms of the plot. It’ll always be cute and cheesy, sometimes including a truncated version of one or more Disney movies. But something felt a little more wrong than usual about the adaptation of Finding Nemo . . . and Broke Hoedown Jr, in all his wisdom, was the one who pointed it out to me: Two key scenes of the film, in which the moral of the story becomes clear, had both been omitted, and as a result, Marlin came across as simply a worrywart, instead of a parent undergoing a serious existential crisis. The first scene we missed was, in fact, the very first scene, which lays the foundation for the central crisis in the film: Can one survive terrible loss and still embrace life? And the second major missing scene was the “swimming down” moment very late in the film, where Marlin synthesizes all that he’s learned, and finally lets his child lead the way. Am I being too hard on poor corporate Disney on Ice by chiding them for omitting these two distressing scenes from a whimsical production, created for the enjoyment of little kiddies? Well, I would have thought so if I hadn’t seen Finding Nemo: The Musical at Disney’s Animal Kingdom at Walt Disney World. The staging and music is every bit as child-friendly, and I wouldn’t hesitate a moment before taking a small child to see it. Yet the creators of this adaptation (better known for creating Avenue Q) kept the spirit of the movie alive, with the angst and fear providing the backdrop for the very real letting-go that every parent in fact must eventually do. Making matters worse, I found myself pondering the “Disney-fication” of Broadway, about which I’m not the first to worry. The family sitting behind me kept marveling aloud (very loudly, in fact) about how inexpensive the Disney on Ice tickets were, in comparison to seeing a Broadway show. The more they went on, and the more detail they went into, the more it became clear that they saw the two as cultural equivalents. . . . and I had to wonder how far they’d take this. When their children were older, would they think they could skip the new Tony Kushner play, because their kids had seen Beauty and the Beast on tour? Would Shakespeare and Albee take a back seat to High School Musical in Concert? I need a little fabulous as much as the next person, but life would be a bleaker place without Angels in America and Who’s Afraid of Virginia Woolf. It scared me in the same way I get scared when I hear someone say (without irony) that they don’t really need to visit London, because they’ve already been to Epcot’s UK pavillion. I’d still “FastPass” Disney On Ice: Finding Nemo, especially for Disney freaks like me who are seriously jonesing for a fix, and whose kids get exposure elsewhere to satisfying narrative and the fine arts. After all, if I’d expected real theatre from Disney on Ice, I’m sure I’ve gotten what I deserved. But please, as a note to the people sitting behind me, and to all those who care about the fine arts: Let’s remember that all that glitters is not gold, and that fancy pyrotechnics are no substitute for good storytelling. Today Bill Ernest, Executive Vice President and Managing Director of Hong Kong Disneyland, announced four new entertainment initiatives for 2008 – Muppet Mobile Lab, High School Musical Celebration, Nemo Submarine “Turtle Talk” and The Art of Animation. I’m sure none of these really do much for park capacity, but they might give Guests a little more bang for their buck, and perhaps keep morale high on those unusual peak days when lines are long.